Music for browsing is an interactive generative soundscape; it is subversive ‘furniture music’ for Internet servers; it is a roadtrip soundtrack for the web traveller. The piece is powered by the energy of browsing – of doing useful things, and of wasting time on the Internet. It is a first-person performance that tackles head-on the old joke about electronic musicians checking their email on stage. 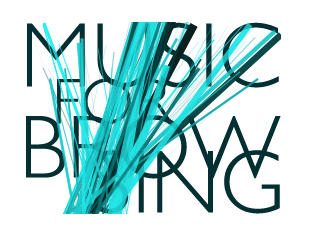 Music for browsing follows your path on the web, and makes sound through the echoes of your footsteps on the Internet. The interface is the web browser as you would normally use it: Whenever you land on a page, your computer temporarily connects to servers around the world to fetch the content. It thus becomes an active part of the Internet’s network space, with data moving to and from you through the web. This transfer is quick, but not instant; it takes a bit of time to move in the network, especially if a server is far, or the infrastructure is old or congested. ‘Music for browsing’ intercepts all active connections to remote servers as they happen, and then echolocates these servers in the network, continuously measuring your distance from them, i.e. how long it takes for messages to go back and forth. Each server gets its own sound, with the overall soundscape reflecting the density and the characteristics of this dynamic network space, (which can be considered to be the internet as your computer experiences it at any given moment). The music you create will depend on your connection, on your browsing patterns, and on where the content you are seeking is stored relatively to you. Eventually, once you stop loading new pages or content, all servers will disconnect and the music will stop – unless a prying website keeping its eye on you, or your browser or computer is reporting back to the mothership. Simply copy the application to your hard drive, e.g. in Applications. While it may run from a USB memory card, it will be slow. 0. Double-click on the application icon to launch it. 1. Then simply launch a web browser and go to any site – any browser will do and any site will do, though each will behave and sound differently. 2. Try it on various connections – the echoes of the Internet will always be different. Each server is given its own sound identity, defined by its IP in terms of timbre, pitch, and spatial position; temporal patterns are generated by the real-time distance of the server to the visitor’s computer, and the amount of simultaneous connections. The software was designed and created by Stelios Manousakis, using the SuperCollider programming language. To see the source code, right-click on the application icon and click ‘show contents’. 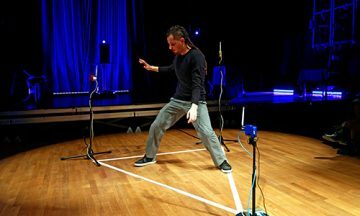 Stelios Manousakis is a composer, performer, sound artist, and researcher. He operates across the convergence zones of art, science, and engineering / composition, performance, and installation / the rich tradition of western sonic art and ‘digital folk’ idioms. His output extends from music performance – most often with live electronics – to intermedia and sound art installations, to fixed medium pieces and film music.